Surprisingly, biscuit recipes aren't the same thing the world over. In many countries, like England, a biscuit is a hard cracker or cookie. In the U.S., the word means a small piece of dough, usually round, that is baked and served with meals. Most biscuit recipes use baking powder or soda as leavening, rather than yeast. Because of this, they're known as a "quick bread" since you don't have to wait for them to rise. Biscuits are filling, which is why they were popular with travelers, cowboys, and families in early American history. They are also quick and easy to make, so you can enjoy them for breakfast, lunch, or dinner. You can add just about any flavor, seasoning, or herb to your biscuit recipes to jazz them up. Try adding cheddar cheese and chives or using buttermilk instead of milk to add a little tang to the taste. You really don't need a box of mix to make biscuits. They are easy to make and use only a few ingredients. In fact, you'll probably find it's just as simple to make them from scratch as it is to open a box, plus you don't get all those preservatives! Don't have time to roll out and cut your biscuit dough? No worries! Just add a tiny bit more liquid and make drop biscuits. Simply drop the dough in large spoonfuls on your baking sheet and bake as normal. 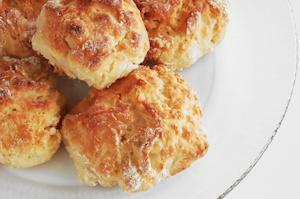 Drop biscuits have a rustic look and taste just as yummy as the rolled variety.